Lock in a great price for Washington Square Inn – rated 8 by recent guests! I liked that each room was different. The feel was quaint. They did a lovely job outfitting each room. The decor is fresh and classy. Breakfast delivered to room free. Nice wine and cheese at night. Quiet location off the main drag in North Beach. Loads of good restaurants nearby. I may stay here again as it was a very pleasant hotel. The staff is delightful. The location is perfect. My stay was wonderful. Bookings .com went above and beyond in making sure my payment issues were resolved and tried to get my money back due to my displeasure in the room. The hotel is in an excellent location. Easy walking distance to restaurants, the cable cars, and Fisherman's Wharf. The breakfast was more of a continental style, but upgraded. It was actually very good. Excellent hotel for the price and location. The room was unique, extrememly clean and the bed very comfy. The wine and snacks in the evening and the cookies at bedtime and the breakfast in the morning were all a big plus. And you can't beat the location for walking the city and seeing the major sites. Easy access to the street! Near the Italian Quarter and Chinatown! Nice bed but a small room (12 and 12 A) The bathroom was great and it was not a problem being across the hall. Washington Square Inn This rating is a reflection of how the property compares to the industry standard when it comes to price, facilities and services available. It's based on a self-evaluation by the property. Use this rating to help choose your stay! Overlooking Washington Square Park, this North Beach, San Francisco boutique inn has contemporary rooms with free Wi-Fi. North Beach Italian bakeries, cafes and boutiques are a 2-minute walk away. Select rooms feature a fireplace or a city view at Washington Square Inn. Styled in elegant wood furnishings, each room features free Wi-Fi, a flat-screen cable TV and subtle colored linens. Afternoon wine and hors d' oeuvres are served to guests daily at the San Francisco Washington Square Inn. A free breakfast is delivered to each guest’s room or it is served at the front desk until 10 am. Oatmeal, granola and other fresh pastries are just some of the continental breakfast items available daily. Fisherman's Wharf is just a 15-minute walk away. Union Square shops and restaurants are within a 20-minute walk of Washington Square Inn. 뀐 Located in the top-rated area in San Francisco, this property has an excellent location score of 9.2! When would you like to stay at Washington Square Inn? Located in the front of the hotel on the street side, this suite features views of Washington Square Park, and Saint Peter and Paul Church.It also includes a closet with bathrobes, and an private bathroom with either a shower/tub combo or a shower only. Public parking is available at a location nearby (reservation is not needed) and costs USD 39.90 per day. Styled in elegant wood furnishings, this room features free WiFi, a flat-screen TV with cable channels and subtle colored linens. The private bathroom includes a shower. Featuring a small seating area with a fireplace, this spacious room is styled in elegant wood furnishings, and includes subtle colored linens. Located away from the street, some rooms offer a partial view to a small courtyard in the interior of the hotel. The private bathroom provides a shower/tub combo. Located in the interior part of the hotel away from the street, this room offers views of the courtyard. The private bathroom includes a shower/tub combo. Please note: the bed type (King or Queen) is subject to availability. 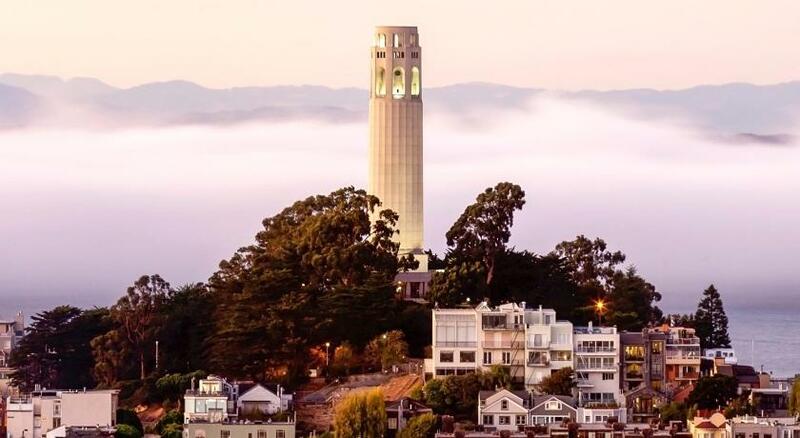 Located on the upper floor with views of Filbert St. and partial views of Coit Tower, this petite room offers an private bathroom with a shower. Featuring views of Saints Peter and Paul Church and Washington Square, this room is located on the ground floor. It includes an private bathroom with a spacious marble shower. ADA features include a fully accessible bathroom and hearing and vision compliant fixtures. Featuring views of Filbert St, this room is located on the upper floor and includes access to the bathroom with a tub located across the hallway outside of the room. House Rules Washington Square Inn takes special requests – add in the next step! Washington Square Inn accepts these cards and reserves the right to temporarily hold an amount prior to arrival. I was fine w/the the stairs but for many older guests, this can be a problem. It should be stated clearly for those that have issues. The lady at the desk when I checked in was not the most customer service oriented. She did not seem welcoming and was just going thru the motion. In the morning, when I went downstairs, a nice Indian man was pleasant and more helpful. Customer service is important to make a guest feel welcome. Not much to ask for, just a smile would be sufficient. It was a convenient location and close to shopping and restaurants. We were in room 8. When they added the TV to this room it was put on a beautiful old table but unfortunately blocked half the mirror. It looks awkward and out of place. Also the lobby does not match with the decor of the place. It is like a upscale youth hostel. Including staff sleeping on the furniture over night. Historic hotels in the heart of SF don't need TVs. The breakfast service was mediocre. With so many fine cafes and bakeries in the area, I would have imagined a broader and higher quality menu. Room was small but bed was comfy. A few homeless close by on a rainy night...but that is seemingly more common in SFO these days. North Beach in general is a bit more run down than I remember. Drop luggage off first as garage is two long blocks from hotel and it is an uphill hike back. The hotel did not disclose that the restroom facilities were separate from the rooms. That is a very important detail that needs to be disclosed. They only provided one key per room. They should provide at least two keys especially since the restroom requires key access too. The staff was rude and not helpful with our payment issues. No breakfast room. All breakfast are served to the room. This should be advised when booking. There was also confusion between day and night when ordering a car to take us to the airport. The confusion meant that it wasn’t done . It’s location and it old fashioned style. They all host wine and cheese every day in the lobby from 5.30 to 6.30. The brown staircarpet! Blue would have looked better! Little touches such as the flasks of coffee and hot water and home made biscuits left on the sideboard in the lounge area, the bottle of water and glasses and array of toiletries in our room plus the daily personal breakfast order.